This week it’s time to visit the Super Friends Magic Theater again! Robin is showing us the “Mysterious Egg Trick,” and he needs a purse from the audience. “Robin tells me that he will empty the purse and then, after showing that the purse is empty, he will mysteriously find an egg in that purse.” – Batman, needing something to do, so he describes in excruciating detail exactly what we are about to see. 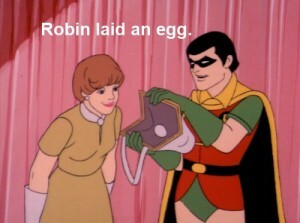 And, just as Batman prophesied, an egg magically appears in the purse. When Batman was checking to see that the purse was empty, HE was adding the egg! Amazing. But here’s the kicker. Robin exclaims that they better get back to the show (the actual stories where they’re supposed to be saving people and things), and then they LITERALLY DISAPPEAR. So you’ll teach us how to place an egg in a purse but an actual cool trick isn’t on the table, just like the volunteer’s purse contents. Whatever. Also, shouldn’t you use a boiled egg? I think that would be an important tidbit to pass on to the small children who may try this trick. 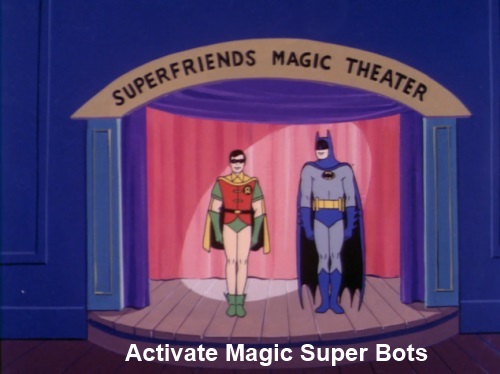 But what do I know – I can’t magically vanish into thin air THANKS TO A CERTAIN CRIME FIGHTING DUO. I guess they had to leave the scene of the crime quickly, since they made all the crap from her purse disappear into their purses. Also, wasn’t this series made in the 1970’s? Why is that woman wearing elbow length gloves? 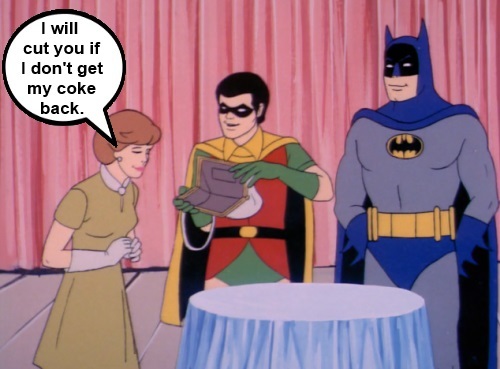 Robin and Batman also wear elbow length gloves. It’s a classy show. Use a hardboiled egg. Check. I mean that just makes sense, right? Wait a second. “Get back to the show?” They’re just actors? I assumed that about Aquaman but Batman and Robin too? I don’t understand anything that goes on over there. All weirdness. No explanation of the teleportation trick? I feel robbed. 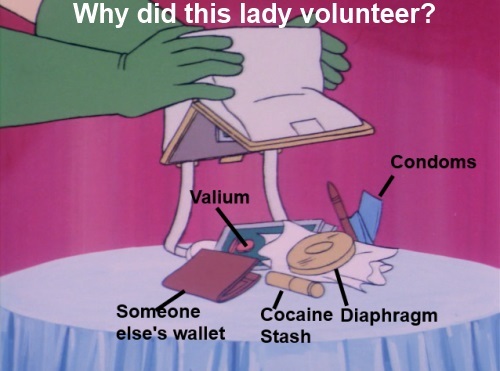 But not as robbed as the lady with the purse.